At the start of the 2018 season GrainSearch placed 1T of Biere Barley seed with 5 growers in the Jeparit/Beulah (Mallee) region of Victoria, with the aim of seeing how Biere performs as a late sown, low input barley. The farmers all sowed the Biere in large commercial paddocks right against their own barley variety. As the drier season continued, Biere began to stand out as the variety that was best coping with the well below average rainfall. By August, four of the paddocks showed Biere clearly surviving much better than the commercial variety. Its faster maturity when sown in late May has enabled Biere to pass through stress conditions quickly and efficiently. Only 1 demonstration area of Biere had completely died – along with the rest of the barley in the paddock (on the harder, tougher soil type found in the flatter sections of Mallee paddocks). Since August, conditions deteriorated further and frost events have been recorded. It will be a valiant effort for Biere to reach harvest point on any of the demonstration blocks. However, even if the paddocks are not taken to harvest, Biere proved its value – by being able to grow more biomass quickly – as a possible valuable standing feed crop, or as a potential hay crop. 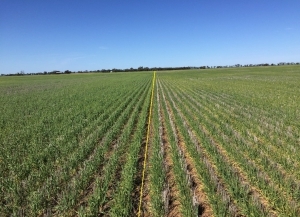 The photo below (taken in August 2018) shows Biere on the left hand side of the yellow line, growing stronger and healthier than the farmer’s standard mid-season variety on the right. This paddock was located just north west of Beulah (Vic).